Or call us to set up an account. A team comprises a group of people linked in a common purpose. Teams are especially appropriate for conducting tasks that are high in complexity and have many interdependent subtasks. A group in itself does not necessarily constitute a team. Teams normally have members with complementary skills and generate synergy through a coordinated effort which allows each member to maximize his or her strengths and minimize his or her weaknesses. Team size and composition affect the team processes and outcomes. The optimal size (and composition) of teams is debated and will vary depending on the task at hand. At least one study of problem-solving in groups showed an optimal size of groups at four members. Other works estimate the optimal size between 5-12 members. Less than 5 members results in decreased perspectives and diminished creativity. Membership in excess of 12 results in increased conflict and greater potential of sub-groups forming. David Cooperrider suggests that the larger the group, the better. This is because a larger group is able to address concerns of the whole system. So while it may not be effective at solving a given task, Cooperider asks us to consider the relevance of that task: "effective at what?" Regarding composition, all teams will have an element of homogeneity and heterogeneity. The more homogeneous the group, the more cohesive it will be. The more heterogeneous the group, the greater the differences in perspective and increased potential for creativity, but also the greater potential for conflict. There was a time when "team building" was all the rage. Each team spent a great deal of time, energy and effort clarifying goals, developing a team charter and establishing operating principles — that is, working on the process of being a team as much as any task itself. Frankly, there is much less time for this in today's work world. While most work is still accomplished by groups of people, these groups do not have luxury for as much self-examination. It remains essential however, that each member clearly understands the goal. Our workshops are designed to help teams fine-tune their efforts to become stronger, adaptable, and more effective. You're an experienced facilitator and looking for ways to introduce an experiential component to an existing program or you would like to introduce a new program. We have solutions ranging from quick profile assessments to one - three hour workshops or multi-day programs. All assessments and workshops come complete with Facilitator Guide, PowerPoint slides, as well as a Takeaway Participant Guide. You're responsible for developing people within your organization. You see a fit with a specific program or set of programs offered by 4D Training Resources and a desired outcome. Your preference is to bring a facilitator experienced in delivering these programs into your organization. Your charged with identifying opportunities to achieve organziational goals through development of its human resources. You would like to use one of these programs as a foundation for building an internal training intitiative. If one or more of these options describes your needs, call us at 1-800-257-4916. What's My Team Member Style? Help team members learn how to contribute to team success. Based on the theories of Marston and Jung, What's My Team Member Style reveals how individuals typically behave on a team and their preference for one of 4 team member styles. 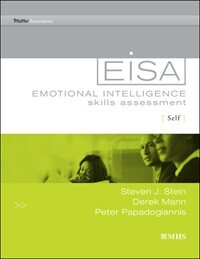 Designed for management development training, the EiSA measures adult emotional intelligence on five scales: Perceiving, Managing, Decision Making, Achieving, and Influencing. The EiSA can be used as a standalone training resource or powerful complement to address leadership development, team building, and communication effectiveness. Using experiential tools that include learning instruments, hands-on activities, and an interactive team simulation, teams gain a clearer sense of direction, clarify roles and responsibilities, improve operating processes, and bolster both interpersonal and interteam relationships. Team-Work and Team-Roles - What makes your team tick? Pinpoints which phases of group work interest your teams most and identifies the behavioral roles team members habitually play or ignore. Great teams don’t just happen. Authentic teamwork is built upon true commitment, trust, collaboration, and competence - qualities that can only be developed with considerable effort over time. For more than 15 years, the Team Effectiveness Profile has helped teams eliminate or reduce blockages in the 5 vital areas of team activity: Mission, Vision, and Goals; Team Roles; Operating Processes; Interpersonal Relationships; Interteam Relationships. A computer-based management development training game for teams, employees, leaders, and managers to learn and practice emotional intelligence skills for better communication, leadership, decision making and interpersonal relationships. Play out vital team skills such as leadership, creative problem-solving, planning, and communication, with our newest game, Maestro: The Team Performance Game. Illustrate the concept of team synergy with Black Bear, a challenging adventure simulation that addresses formulating a strategy under pressure and consensus decision making. Deep in the northern wilderness, a leisurely canoe trip almost ends tragically when your group capsizes into icy, windswept waters. A lively simulation, Swamped helps individuals work together to rank 10 salvaged items for survival. The perfect team-builder for any organization. Treat teams to the exotic, eerie beauty of the Australian bush country. In Outback, your group is lost in unknown territory and mus rank alternatives as well as daypack items as members practice leadership, communication and problem-solving skills. Outcome Focus: Concensus decision making, problem solving, team leadership, communication. A dog sledding adventure in Alaska turns perious when your team is caught in an unexpected blizzard. Can you overcome interpersonal conflicts to save yourselves and your two hypothermic team members? Can your team endure the terror of being trapped in the unexplored passageways of the Cave Without a Name? This simulation develops a full range of group-process skills, including consensus decision making, problem solving, conflict resolution, communication and team leadership. Outcome Focus: Managing group conflict, consensus decision making, problem solving. On the deck of your chartered fishing boat, someone turns the ignition key — and a powerful explosion blows the boat apart. Can your group survive its ill-fated Vacation in the Keys? Fine tune your team's ingenuity and cohesiveness with this high-energy exercise. In Egypt, a hot-air balloon tour ends in trauma when it crash-lands in the endless white sands of the Sahara desert. Ranking salvaged items as well as actioned alternatives, groups must think quickly in an urgent, high stakes situation. Perfect for strategic planning teams. A pleasure cruise along the French Polynesian islands goes sour when your group is stranded on a deserted, nameless island. Your task: rank the 10 action alternatives that will best ensure the team's survival. Marooned works perfectly as a fun and instructive icebreaker. The Grand Canyon Adventures package is a series of team building simulations. The package includes interrelated activities on problem solving, collaboration, crisis management, and consensus decision making simulation. These team building activities are extremely flexible. Use all nine of these video management training activities with your entire team, or split up your group to focus on individualized team building skill development with a single activity. For many team leaders, leadership can seem like an intangible, unattainable skill — one that's best left to those at the top of the organization. But in reality, leadership takes place at many different levels, from strategic directors to team and project leaders. And the common denominator is a set of key recognizable skills that any leader can learn, practice, and develop. From icebreakers and discussion starters to case studies and workshops, HRDQ Activities, are a great way to enhance your curriculum and infuse energy into your classroom activity. Complete training materials in a customizable, reproducible file format. Introducing the Reproducible Training Resources Library, a collection of customizable and reproducible programs. Each program comes ready to train, complete with a Participant Guide, Facilitator Guide, and PowerPoint® presentation. Titles are half to full-day programs on the topics you need to deliver today. The simple click-thru license agreement allows you to use the content within your organization on an unlimited basis. Buy any individual program for $399 or all 80 programs for $7,500. 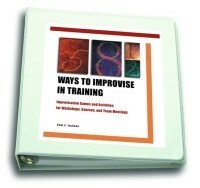 Learn more about these Reproducible Training Resources. This course will make the exchange of information much easier. You will learn how to lay the groundwork, the best way to build and shape a team, how to get the work accomplished and ways to evaluate performance. This program addresses the special considerations of managing geographically dispersed teams, including establishing expectations for completing work and meeting deadlines, maintaining regular contact, legal and safety issues for employees working out of the office, and tips for long-distance coaching and motivation. This program gives you the tools to help ensure that your team runs efficiently while maintaining a high level of motivation and satisfaction among individual team members. This course provides a solid base for making the most of teams by looking at how to create the appropriate type of team to accomplish a particular task, how to prepare employees for the different stages of team development they will experience as their teams mature, and how to change organizational systems and structures in order to create a culture that supports teams. In this program you will learn skills to communicate more effectively, minimize misunderstandings and conflict, and build your sense of value. You will create a team mission statement, ground rules and a plan to foster trust and morale that will lead your team to success. Copyright 2009 4D Training Resources. All rights reserved.